Oklahoma Baptist Disaster Relief: This organization says donations will "go straight to help those in need providing tree removal services, laundry services and meals to victims of disasters." It is requesting monetary donations (It says clothing is NOT needed). For more information, and to donate, visit Oklahoma Baptist Disaster Relief's website. Let others know you're okay! Very critical in search & rescue efforts: The Red Cross is sending similar assistance. It is also working to link loved ones in Moore who are OK connect through a website called Safe and Well. The site is: www.safeandwell.org. People can enter their information on the site or use a search feature to see if their loved ones are listed. Twitter Hashtags: Twitter is also being used as a tool to help find loved ones and aid in the immediate recovery. 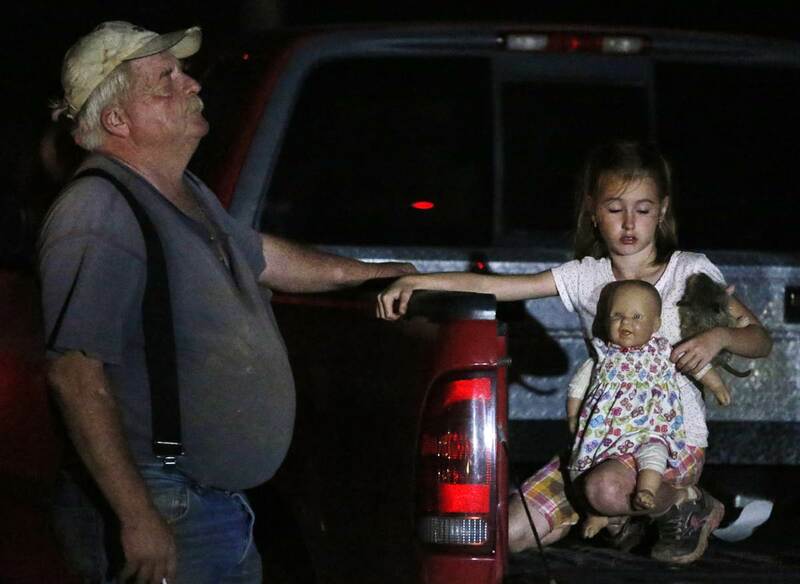 The hashtag #OKMissing is being used to communicate information about missing people, while #OpOK is being used to tell people about where to find shelter and how to volunteer assistance, as well as other information people want to communicate. Several activist groups, including various factions of Anonymous and Occupy, have been instrumental in getting relief and recovery information through Twitter. 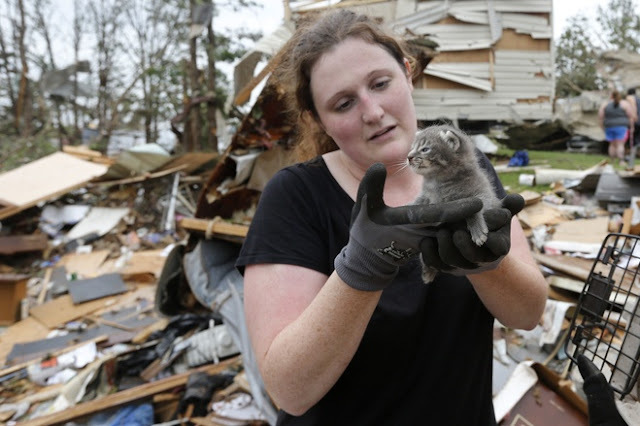 Other hashtags urging people to keep tornado victims in their thoughts trended throughout the day Monday, including #Oklahoma #okc #moore and #PrayForOklahoma. If any professionals are willing to volunteer post trauma crisis counselling or safe spaces use #OKListen #OpOK. 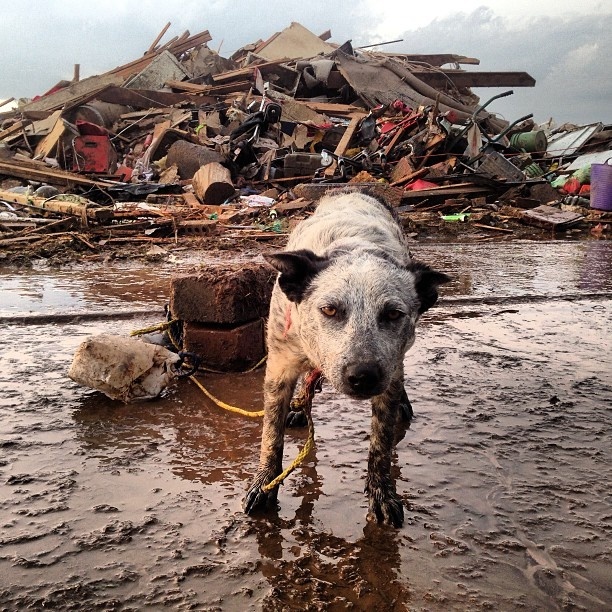 Moore Oklahoma Tornado Lost and Found Animals facebook page. Volunteers help residents who post photos of their lost animals. The volunteers will compare the pictures with photos they have seen elsewhere of found animals. There are other established pages that are helping out such as Moore OK S OKC Lost and Found Pets, a lost and found animal page created in February. Feeding America: Through its network of more than 200 food banks, Feeding America, whose mission is to "feed America's hungry through a nationwide network of member food banks," says it will deliver truckloads of food, water and supplies to communities in need, in Oklahoma, and will also "set up additional emergency food and supply distribution sites as they are needed." You can donate online here. Phone: 1-800-910-5524. Text SHELTER & your ZIP code to 43362 (4FEMA) to find the nearest shelter in your area. Graceway Baptist Church – located at 1100 S.W. 104th in Oklahoma City. Oakcrest Church of Christ – at 1111 S.W. 89th Street in Moore. Victory Church located 4300 North MacArthur in Oklahoma City. 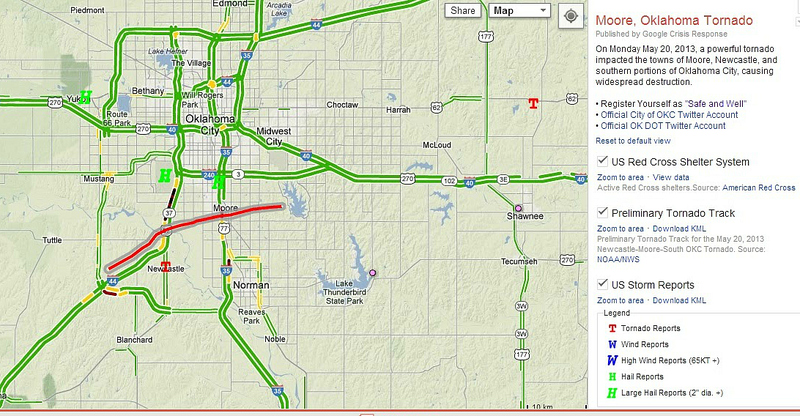 Journey Church in Norman I-35 and Tecumseh Road is open as a shelter. Fifth Street Missionary Baptist Church, located at 801 N.E. 5th St. Oklahoma City. Trinity Church of the Nazarene is open as an emergency shelter. It is located at 7301 S. Walker, just on the north side of I-240. 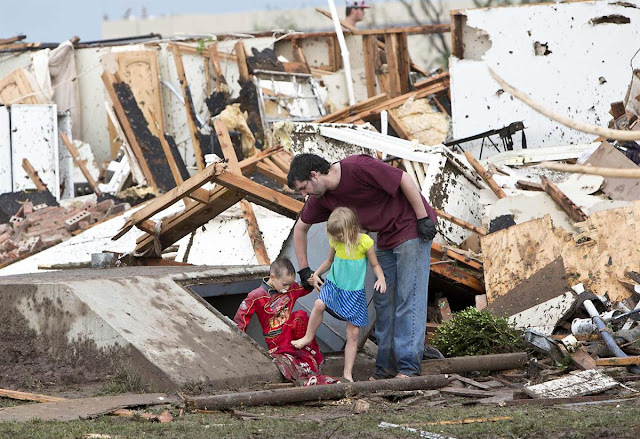 Habitat for Humanity is working to help those affected in Oklahoma as well as in neighboring Texas, where 60 Habitat homes were damaged by a tornado there. 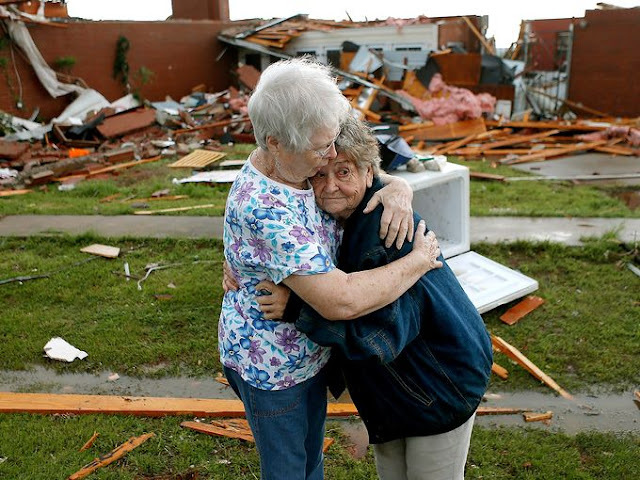 AmeriCares is helping to provide emergency aid and resources in areas affected by storms at a moment's notice. AmeriCares provides health care resources, first aid and emergency clean-up kits in areas like Moore. Crews from the North Carolina headquarters of Christian relief organization Samaritan's Purse are already on their way to Oklahoma to help provide relief in Moore and other communities affected by the tornadoes. The Baptist General Convention of Oklahoma's (BGCO) Disaster Relief Fund is helping to provide tree removal services, laundry services and meals to those affected in the area. 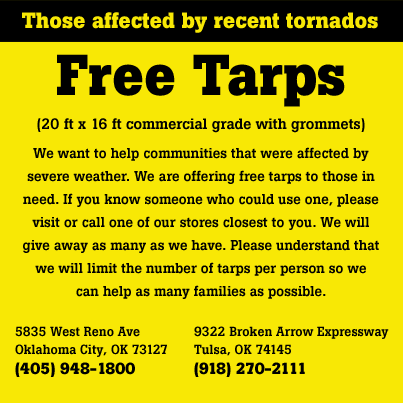 Free Tarps! Just call or go to the address!! 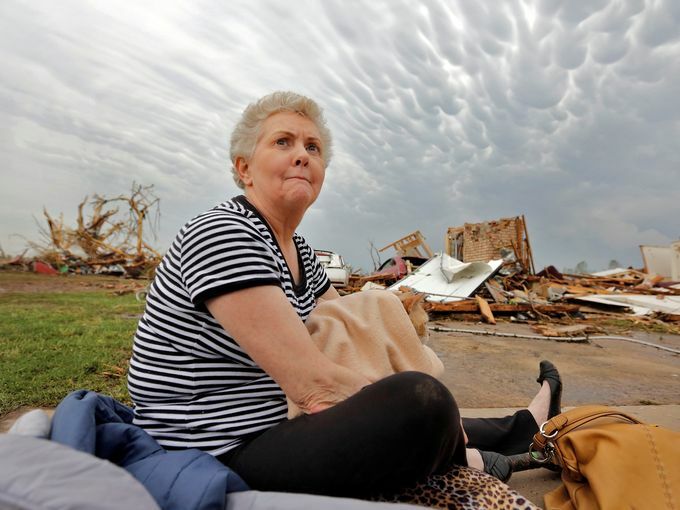 A 53-foot mobile support unit to for residents of Moore and surrounding areas will be located at the Red Cross Shelter located at 201 S Howard in Moore, OK. This unit is equipped with emergency phones, charging stations and internet capability. A mobile command center will be available to support public safety officials co-located with the FEMA command center in Moore, OK. Please be a smart donor - call ahead and see what the biggest needs are. Do not bring clothing unless asked. Feed the Children donation center (donations) – Feed The Children is preparing emergency disaster relief supplies to aid victims of the Moore tornadoes and will be accepting donations from the public on Tuesday, May 21, from 8:30 a.m. until 4:30 p.m. at the McCormick Distribution Center (29 N. McCormick). Items that will be accepted are diapers, canned goods, non-perishable food and snack items, water and sports drinks. Salvation Army at KFOR-TV studios (supply drop-off) – Items needed: Bottled water, Gatorade, Wipes, Diapers, Baby formula, Hand towels, Individually wrapped snacks, Work gloves. Please do not bring gloves. Financial donations can also be made to the Salvation Army. Text “storm” to 80888 to make a $10 donation. Journey Church in Norman I-35 & Tecumseh in Norman Culver Electric: filling trailers with water, diapers, wipes, formula, gloves, hand tools, sunscreen, Gatorade, and all needed items on the salvation army and red cross list. 1823 West 20th in Elk City. 50 Penn Place: Clear Channel station in 50 Penn Place will accept donations at the west entrance. Location: Street(s), City and Phone (if known): N.W. 50th and Penn West entrance. 405-228-9500. Salvation Army at KFOR-TV studios (supply drop-off) – Items needed: Bottled water, Gatorade, Wipes, Diapers, Baby formula, Hand towels, Individually wrapped snacks, Work gloves. Financial donations can also be made to the Salvation Army. Text “storm” to 80888 to make a $10 donation. The Oklahoma City Police Department has been receiving numerous phone calls from persons wanting to report a family member missing. We ask anyone who needs to make a report for a loved one who resides in Moore to contact the Moore Police Department. The City of Moore is looking for volunteers for a cemetery clean-up on May 22nd at 9:00 am. 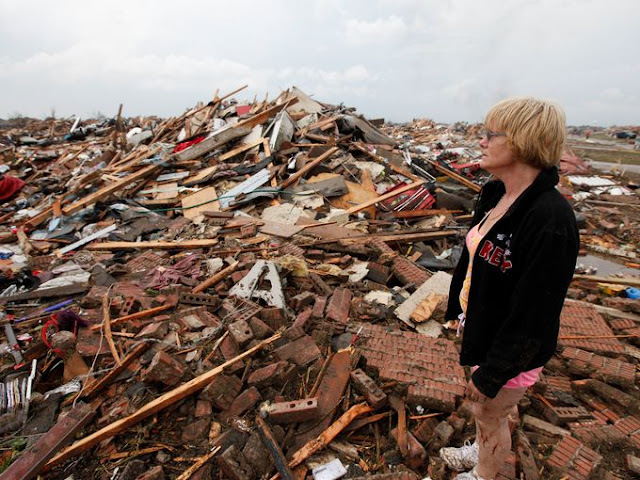 Volunteers will be picking up debris from the May 20th Tornado. If you would like to volunteer your time, please meet at the Moore Community Center, 301 S. Howard. The group will be escorted to the Southgate Baptist Church, where they will walk to the cemetery on foot. Please bring gloves, rakes, etc., and be sure to wear heavy-soled shoes. This is the only volunteer opportunity at this time. For more information, please contact the Moore Parks Department at 793-5090. Journey Church needs volunteers now! They stated: We are getting pretty low on volunteers right now! If you can, come on out!!!" We have been notified that Primrose Funeral Home of Norman will handle the arrangements of any of those lost in the tornado at no charge to the families. Aid for American Indian Families in Oklahoma: Tornadoes displaced and affected American Indian families in the communities of Shawnee, Bethel, and Little Axe. 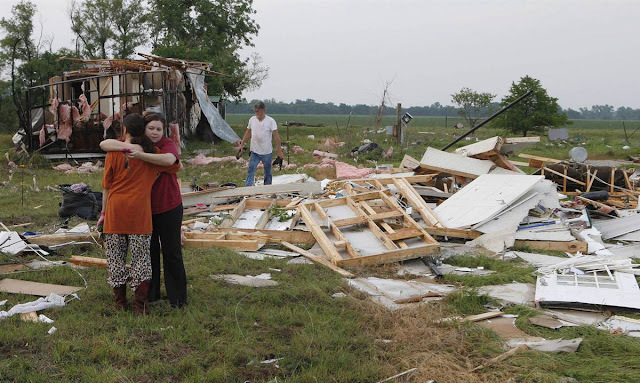 The Oklahoma Indian Missionary Conference (OIMC) Disaster Relief Team – whose mission is to provide direct support, care, and assistance to American Indian victims of disasters – is serving as a focal point to coordinate Native relief efforts. Rev. David Wilson (Choctaw), dwilson@oimc.org, head of the OIMC Disaster Relief Team, has provided telephone numbers for people who need help or who want to provide assistance; the team can be reached at 918.724.1966 or 405.632.2006. Also, donations can be made online on their website at www.umc-oimc.org. PLEASE CLICK HERE TO SIGN UP ON THIS WUFOO FORM. TO VOLUNTEER TODAY IN LOCAL COMMUNITIES - SEE IMMEDIATE NEEDS LISTED BELOW. Thank you! NOTE FOR OUT OF TOWN VOLUNTEERS: Overnight accommodations are NOT available, please be sure to make your own accommodations ahead of time if you need to stay overnight. This list will be updated periodically throughout the weekend. there are many communities needing assistance! GROUPS LESS THAN 25: Meet us at Serve Moore HQ at 200 S. Howard Ave. If possible, bring heavy duty wire cutters, gloves, trash bags, sturdy metal rakes, shovels, chainsaws, and sunscreen. Sharpie markers too! Tasks: neighborhood restoration and debris removal. needs help with debris clearing and pick up tomorrow (Saturday). 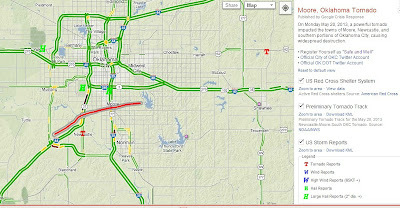 (Hardesty Road and Highway 177--see directions on their website: http://www.localharvest.org/pottawatomie-county-farmers-cooperative-market-M42015). Jason McPhail is running the operation (937-212-4200). You do not need to call him, just show up at 8 AM Saturday. He will provide a brief orientation to everyone. Wear long pants, closed toed shoes, bring a shovel, and work gloves. They really could use some people who can bring chainsaws (and know how to operate them). Tasks: outdoor manual labor and indoor work. Samaritan's Purse Headquarters is working in the Shawnee/Bethel/Meeker areas. Call 405 273-5331 for information. It is not a supplies distribution, but if you want to bring water, Gatorade, or food, please call the number. Tasks: debris clean up, chainsaw work and roof tarping. volunteer headquarters are in the gym of Covenant Life Assembly on 207 S. Howard Ave. From the north take I-35 to 27th St exit, take a left on 27th and an immediate right on Broadway. Then roll in on Broadway straight into Old Town. They are also in need of the following items to be delivered to 207 S. Howard Ave.: Water for Volunteers, Gloves, Rakes, Shovels, Wheelbarrows, Trash bags, Work gloves, Chainsaws, and lots of volunteers. At the current time we are not taking out of state teams at this location. We are also not facilitating the use of out of state teams. And we are not housing out of state or out of town teams. Bring a good set of gloves is you have one. Tasks: unloading vehicles, taking donations to their designated spots, and loading people's vehicles who are in need of supplies. Please contact the Assembly of God at (405) 865-2289 and Luther Town Hall (405) 277-3833 for more information and ways to get involved. (I-35 and Tecumseh) VOLUNTEERS NEEDED! Hours of Operation are 9am – 6pm Monday thru Saturday & 1pm – 6pm on Sunday. Looking ahead: Email help@journeychurch.tv to sign up for a shift this weekend. Volunteer opportunities are for ages 12 and up. Volunteers under the age of 18 must be accompanied by a parent or legal guardian. NOTE: They are no longer taking clothing donations, dog food or fresh produce. NEWCASTLE NEEDS VOLUNTEERS! until 8 p.m.
Meet at Braum's, 414 NW 32nd St, Newcastle, OK 73065 (exit 108 on I-44/Hwy 37) Volunteers are needed to do cleanup work. To help, meet at the Braum's in Newcastle at the Hwy 37 exit off I-44 between 8am-8pm May 23 and 24. Workers will be shuttled to worksites, mostly to drag off tree limbs. Dress prepared to get muddy and wear gloves if you have them. Experienced volunteers can also bring chainsaws or tree clippers. Tasks: primarily drag off tree limbs. Bring an open mind and flexible heart. Tasks: deliveries and clean-up work. You can drop off at the Norman Chamber (115 E. Gray) or directly to the area at Absentee Shawnee Tribe Community Center 1970 156th Ave. NE - all items brought to the chamber will be going here for now. They are also taking volunteers for the resource center and in the field. OKMRC is designed to bring together different healthcare-related organizations and members of the community, including physicians, nurses, public health workers, and other medical professionals. In addition, volunteers without a background in medical training are needed. To volunteer, go to www.okmrc.org and click on “OKMRC Inquiry”. Please click on the opportunity link for more information about volunteering. In the coming weeks we hope to organize some cleanup events and also connect you with trusted organizations that are doing the most good for the tornado victims. Sign up for our Tornado Relief email list below if you want to receive more information as opportunities to help develop!